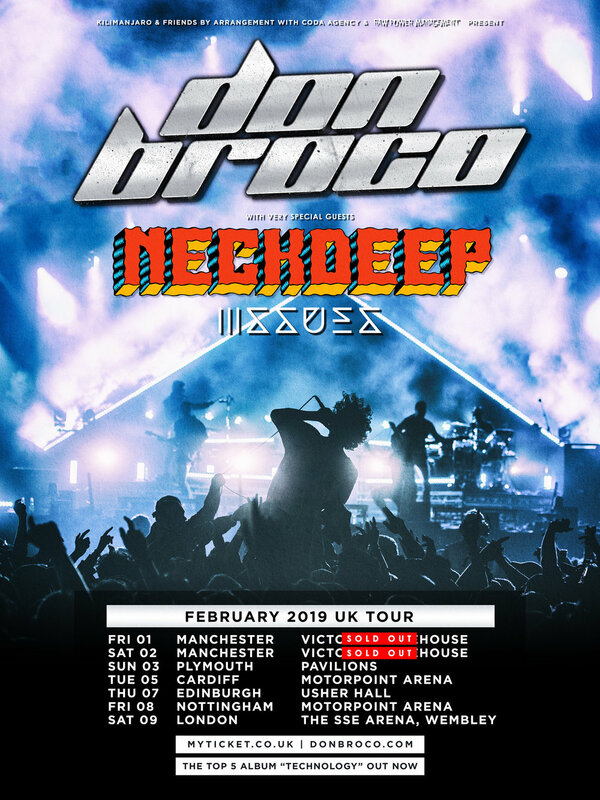 We were invited along to Plymouth Pavilions to catch the legendary DON BROCO on their UK arena tour, they’d already played two Manchester dates so we were hoping that they’d be warmed up and ready to blow the roof off the place! Before the crowd were consumed by the explosive sounds of Don Broco, the evening’s entertainment is kicked off by American rock band ISSUES, followed by the Welsh pop-punkers NECK DEEP. The adrenaline pumped as the audience anticipated the entering of the Bedford quartet onto the stage. After a 30 minute wait, the lights were killed and a silhouette of drummer Matt Donnelly appears. The room echoes with his smooth, harmonic vocals of the synth hook ‘Come Out to LA’. Suddenly, the band join Donnelly on stage where the tempo and dynamic abruptly changes initiating the first mosh pit of the night. This is followed by more tracks from their latest album such as ‘Pretty’ where lead singer Rob Damiani gets the audience (much to the dismay of the security team) to inaugurate a swarm of crowd surfing, and ‘Technology’ introduces the cowboy character to the stage, a figure who features heavily in their four latest music videos. The turbulent energy emitted from the crowd continues as they play their fifth track ‘The Blues’ which spurs an influx of beat driven arm waving as the bridge repeats the lyrics “I’m gonna ride that wave”, followed by the song ‘Superlove’ where Damiani gets everyone jumping to the catchy lyrics and funk inspired bass line played by Tom Doyle. Damiani begins to talk to the crowd, stating that Plymouth was “The first gig we played since coming out of our hometown”, however he gets interrupted by Donnelly who announces that he’s broken his snare drum. After the technical issues were resolved, the mood suddenly changes into the grungy, anger fuelled track ‘Porkies’ which again induces the crowd into a frenzy of mosh pits. The audience are then further confronted with the cowboy character, who plays a guitar solo on a small stage at the back of the room, which transitions into the track ‘Everybody’. This is followed by another atmospheric change as they play an acoustic version of ‘Further’ , however, the mellow mood doesn’t last long as ‘Stay Ignorant’ starts to play, where towards the end Damiani asks “Does anyone know what a circle pit is? - I wanna see the biggest circle pit Plymouth has ever seen!”, the crowd didn’t need to be asked twice! After the audience rock their way through the tracks ‘Automatic’, ‘Priorities’, ‘Greatness’ and ‘Nerve’, the room fades into darkness where the encore awaits. The crowd are abruptly awoken to strobe lighting and the opening lyrics to their latest single ‘HALF MAN HALF GOD’, followed by the track ‘Thug Workout’, which was their first song ever written. Don Broco concluded the set with ‘T-Shirt Song’ , where you saw various members of the audience removing their t-shirts and waving them around their heads to mirror the lyrics “I take my t-shirt off, swing it around my head”. Damiani then throws a t-shirt into the crowd before the almost eerie outro plays, haunting the fans with the realisation that the gig has finally come to an end. Don Broco has been one of the best live gigs I have ever attended. The mix of dulcet vocal tones, paired with muscular guitar riffs and solos sent you on an emotional rollercoaster and you can’t help but join in with the mosh pits. In a recent interview, Damiani goes on to say how his music was influenced by how it would sound live and what would get the crowd going and I can safely say, they did not disappoint.